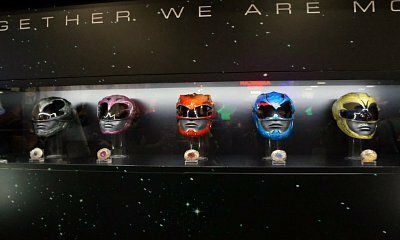 San Diego, CA, United States (4E) – “Power Rangers” movie was at the Comic-Con International: San Diego and they have showcased the new look of the helmets and Power Coins to be featured in the upcoming movie. The official Twitter account for the “Power Rangers” movie also told fans about the props displayed at the Comic-Con International: San Diego. As per the photos released on social media sites and other news publications, the helmets were fashioned in a way that it blended the classic and the modern look for the new movie. There were four helmets presented at the Comic-Con International: San Diego. The colors were silver, pink, blue, orange, and yellow. Alongside the helmets were the Power Coins that have the same colors as the helmets. As opposed to the first props and costumes of the other “Power Rangers” installments, the helmets and the Power Coins now are shinier and sort of metallic. It also has a rock-like appearance making it look like the helmets and the Power Coins were actually carved from stones. More on the Power Coins that are to be used by the characters of the “Power Rangers” movie to morph into their armored forms, they are not like the first coins that had various prehistoric creatures. This time, they sort of contain pieces of amber or rocks. The “Power Rangers” movie is now being filmed in British Columbia, Canada. It is directed by Dean Israelite and it stars Dacre Montgomery as the Red Ranger, Naomi Scott as the Pink Ranger, Ludi Lin as the Black Ranger, R.J. Cyler as the Blue Ranger, and Becky Gomez as the Yellow Rangers. It is set to be out in theaters this March 24, 2017 in the United States. Lionsgate is reportedly planning to give more updates about the “Power Rangers” movie at their Hall H presentation over the weekend still at the Comic-Con International: San Diego.